Uniquely Grace: I SCRAPED MY WALLS!!! Hello everyone I am here to share with you the only creative thing I have been working on lately. Here is it... are you ready... My NEW Scraproom paint job!!! Yup there it is... and this picture does not do it justice. I have to say I am very happy with the way it turned out. I have never chosen orange (my least favorite of the basic colors) ... err... Butternut squash as a color for the walls before and I have to admit the only reason I went with shades of orange is because it is (in color theory) the color that inspires creativity the most out of all the basic colors. 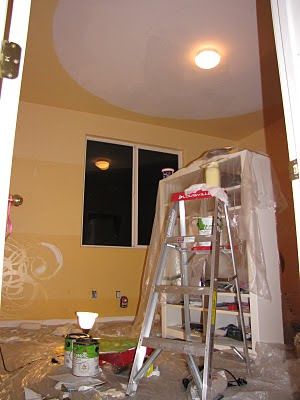 This next pic shows how we divided up the fading on the ceiling. On the walls it was striped and the ceiling we did circles for a more natural look since the light is centered they compliment each other. To draw the circles on the ceiling we used the light as an anchor and tied a sting around it then measured out where we wanted the circle to be. Tied a pencil on the other end of the string and drew around the room using the ladder to reach. Keeping the pencil at the same point tied to the sting. Like a campus. It worked great for creating guidelines and in the end looks perfect with the lighting. To fade or blend each shade of orange I took the darker color and added some faux finishing glaze to it, about 3/1 glaze and paint (read the label and test it in a corner first). 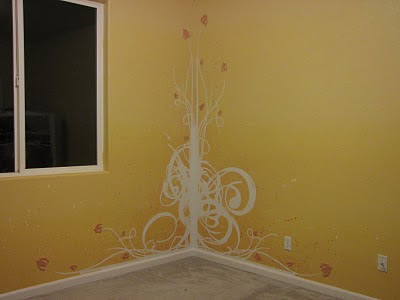 I painted it over the line, just above the matching color, for about 1' above the line and 3"-4" below it. Then wiped it off a bit around the edges with a cheese cloth (found at your local hardware store). This thinned out the glaze and helped blend the colors. I repeated this 4 more times, each time mixing a new color shade with glaze and then painting and wiping off. 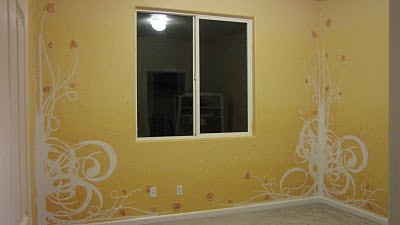 When you add a glaze to paint it extends the dry time creating a larger window of "open time" on the wall where you can play with the paint before it will dry. This step too about 24-30 hrs to completely dry with no tacky spots. Possibly having to repeat it due to my strait, crisp and clean lines I painted when switching shades. 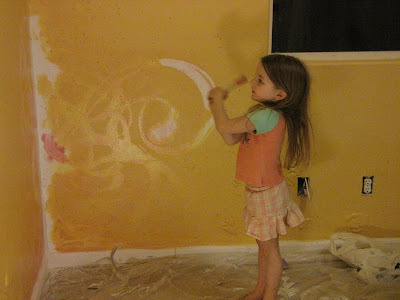 Once I was satisfied with the blending and fading my daughter and I had some fun. 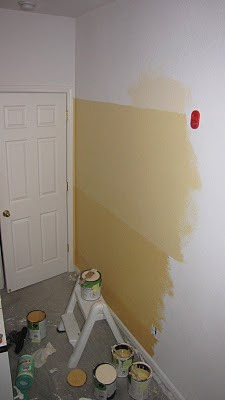 We tossed and flinged three different colors of paint onto the walls, red, antique gold and white. Splattering and giggling it was great to allow her to be a part of the most complex design I have ever painted. I know this post is long but I promise you it is almost done. 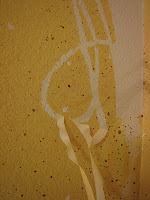 After flinging the paint onto the wall we began to peel off the contact paper mask. It reveled beautiful white flourishes in primer... so I had to paint it with a white. Tedious? Yes but necessary. Like almost every textured surface when tape is used there is never a clean edge. I then added the red and gold glaze mixture to the flowers and leaves. After this step I looked back from the door and decided it was done. So time to clean up and get a fresh white coat of paint on the thoroughly covered, multi colored base boards. It was now time to move in the furniture and begin to unpack my nine boxes of scrapy stuff! I hope you enjoyed this post and I will be posting more once the room is unpacked, decorated and ready for some scrappy business. Have a blessed day! Oh My Goodness Grace....What a wonderful job you did on this...I cannot believe that you did this...what a true artist you are...It is STUNNING!!!! Can I come live you with you....please!!!! Love this idea! 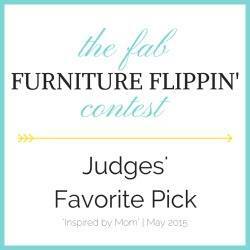 Will have to give this a try on my next scrapbook nook! Everything looks great love the pic of your dd all painted lol! !She is posing so sweet and angelic but covered in paint lol! Too cute! Your room is wonderful (and your daughter soooo cute). You've made me want to drag everything out of my room and redo it! I love it! You did an awesome job, I just know you will enjoy your new space! Now I am off to cut some flourishes with my Ecraft, tape them to the walls, trace them out, then paint in the lines lol this would be the short cut/alternative to tearing up my room and starting over again lol Thank you for the inspiration! !